Q: Can I use Wootric "set and forget" sampling rules with surveys in Intercom Messenger? A: No, you will need to use native Wootric surveys. Intercom Messenger surveys are deployed via auto-message trigger or manually. Q: How do I send surveys in multiple languages? A: In the current version of the Wootric Surveys Messenger App, you can only send surveys in 1 language. We are working hard to bring the Wootric Surveys Messenger App up to feature parity with the rest of our delivery methods. Until then stay tuned! Q: I want to filter and analyze my NPS (or CSAT, CES) by customer segment in Wootric. Can I pass Intercom attributes into Wootric when I deploy surveys via Intercom Messenger? A: Yes, contact Wootric support for setup. Note that segmentation is a Pro Plan feature. the name you want to call that attribute in the Wootric dashboard. 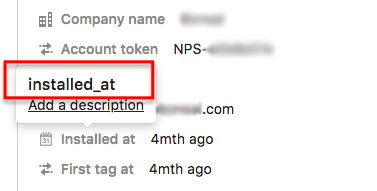 You will find Intercom's name for your attribute by hovering over the attribute. you would send us installed_at and could call it Installation_Date in the Wootric dashboard. Q: How do I send Wootric data to Intercom from my project account that IS NOT connected to the Wootric Surveys Messenger App? A: If you have synced one of your Wootric project accounts to send Wootric surveys in Intercom Messenger, you can still receive data from your other Wootric project accounts. Data from these accounts will update automatically in your Intercom records. Log into the Wootric account you would like to sync and go to that account’s settings. Click on “All Integrations” in the left side column. Click on "Send Wootric Data." Click the “Connect” button next to the Intercom integration and follow the instruction for the sync process. Q: How many Wootric project accounts and survey types can I use in Intercom Messenger? A: Wootric's Intercom Messenger App currently supports the use of one Wootric account and one survey type (NPS, CSAT or CES) in your Intercom instance. Q: If I connect a single survey project account to Messenger, will survey responses from my other project accounts still appear in Intercom records? A: Yes, if you have previously synced your other Wootric accounts to Intercom, you will continue to see survey responses in your Intercom records. Q: I connected my NPS account to Intercom Messenger, but now I want to use a different survey type. How do I switch my Messenger app to a different Wootric survey account type? Simply install the Messenger app on the account you wish to use. This will override the installation on your other account. Click the button below to go to the app store listing. During the install process, you will then choose the other project account that you wish to connect. This process disconnects the original project account. If you want to see that account’s data in Intercom records, you will need to go to Wootric settings to re-sync the data. To do so, refer to the instructions in the first question of this FAQ. Q: I am seeing an error message when I try to insert a Wootric Survey into an in-app message. What should I do? A: If you see an error like the one below, please go to the app listing to uninstall, then reinstall the Wootric Surveys Messenger App.